This is a completely customized Boy Scout theme Scoutmaster wedding cake topper ordered by one of our customers. They are both Scoutmasters (yes, the bride is a female Scoutmaster, with her own Boy Scout Troop, though that is pretty unusual—she is also the leader of a co-ed Venturing Crew and a Girl Scout troop!) and they first met through their Scouting activities. They are also very active at the district and council level with scouting activities such as the Eagle Scout advancement board, adult and youth training, etc., and also take their Scouts on camping and high adventure outings each month. Because they are so involved with Scouting, they have started to try to coordinate their calendars so that their meeting nights and camping trips are on the same days! For their upcoming wedding in December, they are inviting all the members of their Scout troops (over 100 kids and their families) and asking them to attend in uniform, and they are going to include them in the ceremony with some kind of literal and figurative “tying of the knot”. (They’re also trying to design a square-knot design into the wedding bands.) 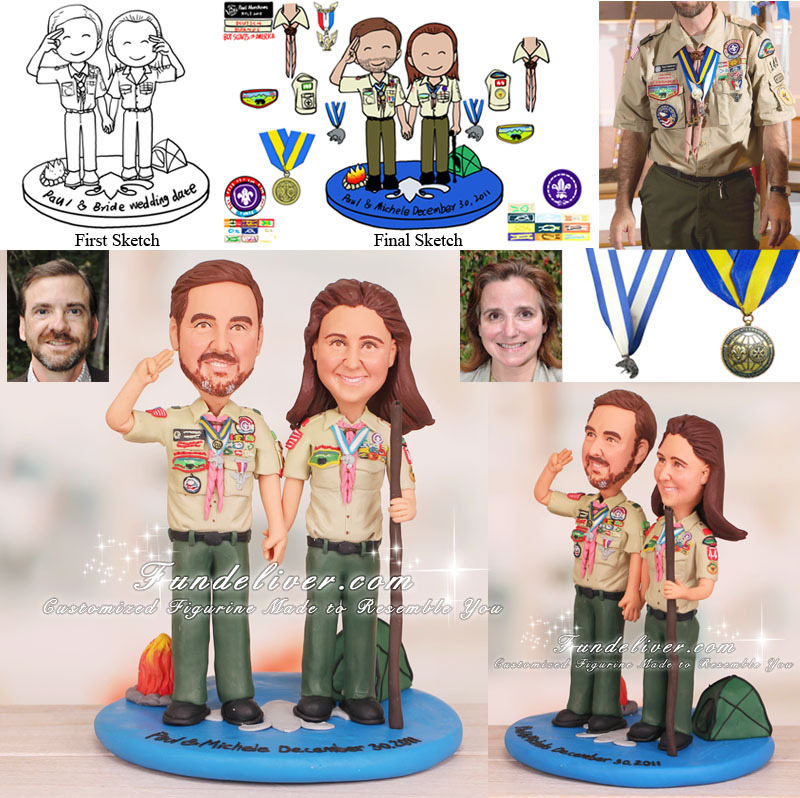 Their wedding cake is also going to be decorated with Scouting themes, but for the actual wedding the bride and groom will not be in uniform (tuxedo & dress)—so they very much want their cake topper to be them in their Scout uniforms to represent this important part of their lives! For the pose, they would like the couple figurine to be holding hands, the groom to be saluting to the guests and bride to be holding a walking stick. Because the cake will be pretty much decorated already, they don’t need to have many decorations in the way of background—just a tent and a bonfire are fine. One key point is the fleur-de-lis, they would like to add this Scouting symbol to the center of base to make an interesting contribution to the composition! 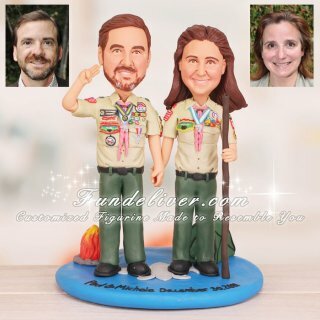 Love this Boy Scout theme Scoutmaster wedding cake topper? Why not incorporate something that you are really devoted to? Just send us your ideas and reference images, we will first design some 2D sketches to get your approval and then turn them into 3D figurines.